'Tis the holiday season and with so many gift options, it can be overwhelming to find the perfect gift. If you're looking to cross that foodie off your gift list, I have some great options from sweet treats and cooking classes, to artisan gift packs, and food tours! 1) Greyston Bakery Brownies: Greyston Bakery is the proud baker of the brownies in Ben & Jerry's Chocolate Fudge Brownie and Half Baked and have their own line of decadent brownies. But that's not all. They make their delicious treats to hire individuals with barriers to employment and to provide a host of social services to the community. For over 30 years, Greyston has maintained an open door hiring policy, offering employment opportunities regardless of educational attainment, work history, or past social barriers, such as incarceration, homelessness or drug use. They offer a selection of brownie gift boxes that not only are insanely delicious (trust me), but go toward ending poverty and giving those in need employment. 2) Jeni's Ice Cream: Just in time for the holiday season, Jeni's released a new lineup of flavors, including Sweet Corn Spoon Bread and cinnamon-infused Churro with toffee & flakes of pastry. Perennial favorites such as Buttercup Pumpkin with Amaretti Cookies & Dark Chocolate Peppermint are available by the pint or as part of limited-edition collections: Bright ($48), Merry ($48), Holiday Pairings ($48) and the Splendid Holiday Collection ($58). Last-minute gifters can use the Jeni's pint-finder to pick up pints at their local grocery store, or stop in to any one of Jeni's 23 scoop shops. 3) Wine Folly, The Essential Guide to Wine: The BF picked up this book for us and it's a great how-to guide for understanding wine, in the simplest of ways. The book is mostly comprised of infographics, making it super easy to learn about wine and wine pairings. Think of it as a picture book for wine-loving adults! 4) Chicago Food Planet Food Tours: This Chicago food tour company plans a variety of in-depth food tasting and cultural tours of Chicago neighborhoods. I went on a tour of Chinatown with them last year and loved it! 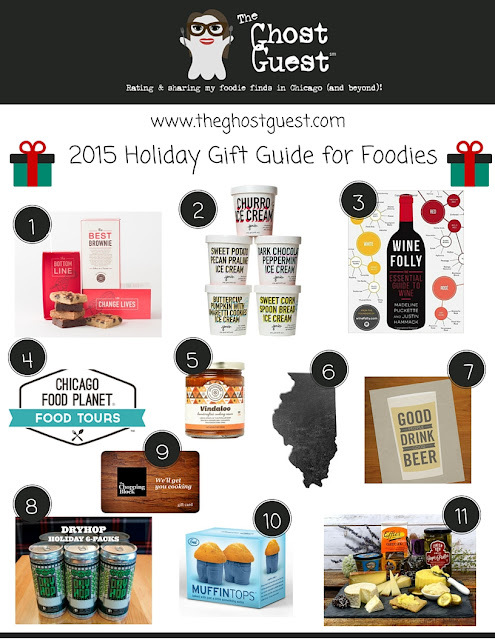 You can buy a gift card so your foodie friend or loved one can pick the tour of their choice. 5) Spicemode Indian Sauces and Seasonings: Spicemode is a Chicago-based company that makes incredible Indian cooking sauces, including masala, vindaloo, and madras, and seasonings, including tandoori smoke, masala herb, and vindaloo fire. You can purchase them directly on Spicemode's website, as well as in Whole Foods and other specialty stores. 6) Illinois Slate Cheese Board: If there's one food group I love, it's cheese. Why not make a fun cheese tray to show off your Illinois pride? This slate cheese board comes with chalk so you can indicate the types of cheeses on your board. 7) Food and drink art prints: If you don't want to get the foodie on your list something edible, why not get them a cheeky food or drink-related art print? I've purchased prints from this Etsy shop, but there are so many artists to choose from! 8) DryHop Brewers and Corridor Brewery & Provisions gift packs: Both Chicago breweries are offering gift packs including their signature 32-ounce crowlers (can growlers), as well as t-shirts, stickers, and beer glasses, so you can rock your love for local brews. 9) The Chopping Block Gift Cards: The Chopping Block is Chicago's premiere cooking school with a variety of cooking classes for pros and novices alike. I've attended a few classes myself and they are always fun, informative, and most of all delicious. A gift card to The Chopping Block is a great gift for foodies who love to cook, or may want to acquire some new culinary skills. 10) Fred & Friends Muffin Tops: If you're looking to give a funny or cheeky food gift, look no further than Fred & Friends. They have a ton of hilarious kitchen gadgets, including these muffin top baking cups! 11) Pastoral Artisan Cheese, Bread & Wine holiday gift packs: Pastoral Artisan Cheese, Bread & Wine is bringing the Pastoral experience to people’s homes through a variety of classic and approachable cheese and wine collections. Each collection is inspired by Pastoral's artisan producer partnerships and comes packaged with artisan products, such as cheese, wine, charcuterie, chocolates, spreads and more, and the stories and people behind them, and how to enjoy them. You can even gift your Pastoral collection in a handcrafted wooden cheese box! way to cheese and wine expertise. them and how best to enjoy them. experts select optimal wines to accompany each collection in both theme and flavor.